Costco frozen hake fish filets are a flexible and healthy alternative for dinner. The filets thaw in a bowl of cold water in about 60 minutes. 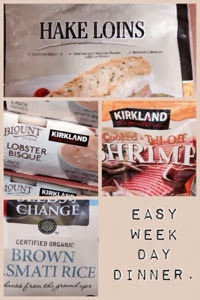 I've used them to make an easy entree with the Costco lobster bisque. Heat the bisque to simmer, put a couple handfuls of thawed shrimp in the soup, cut the thawed hake filets in one inch slices and simmer all until warm, but don't boil. I serve this over Seeds of Change basmati rice. Bob likes it. I find the constant changing of products fun but also confusing.